and I only eat lettuce if it's smothered in dressing or on a sandwich..
My kids are the same. She is the world's pickiest eater. Hum, wonder where she gets that from? Well, I found this recipe for a smoothie here. It's filled with yummy juice, strawberries, and oh yeah, SPINACH! My kids literally beg me to make this for them every morning before school! The tricky part is getting the spinach in without them seeing! Here is the recipe: give it the taste test, I guarantee your gonna love it and your kids will never know they are drinking their veggies! depending on how much you need to cover up the green! Blend well in a blender on high until there are no signs of spinach. don't forget everything in my etsy shop is 20% off! What a great recipe! Will definitely give this a whirl. We found a really incredible supplement that helps kids get more veggies too. I love your blog and all the wonderful things you share. You are an inspiration! Look at you little trickster. I'll have to try this, we are so bad about eating our vegetables. Seriously ? Spinach ?? Do you have to add any sweetner ? I would go make this right now except I don't have any spinach ! Thanks for passing this on! Another way to add spinach is to mix it in with salsa. My son loves anything spicey, and I can add spinach or any kind of greens...it just thickens it up when you put it all in the mini chopper. It can turn nachos into a healthy snack! I do love veggies and always liked them as a kid, too. I guess I was odd. 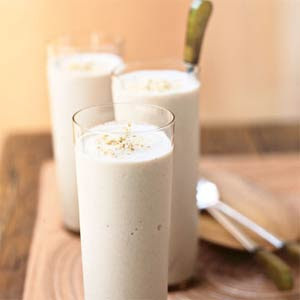 This smoothie sounds delicious and a great way to start the morning! I am going to try this tomorrow! Thanks for passing along the recipe along. Have a great weekend. I will try this too even though my kids do eat veggies, they actually like them. Not all, they are not big squash, pepper or onion fans. But most green veggies they will devour and thus I have an extra freezer in the garage full of bags of frozen spinach! We eat it all the time but I rarely make veggies with breakfast unless it's in an omlet. Nice job MOM! Sneaky, sneaky. Hey girl are we gonna see you at our Portland show? I love mixing veggies in our smoothies. Sweet strawberries seem to disguise veggies the best. Blueberries work well with brocolli. Start with a small amount of broccoli the first time. Each time add a bit more. You'll know when your family starts to notice. I am so going to try this! Thanks. oooh! How sneaky! Lucky for me, husband and I both love spinach but I'm betting when little Evie gets bigger, she prob won't;) Thanks for the fab and health recipe! I just voted for your hot chocolate station! Such a cute idea!! 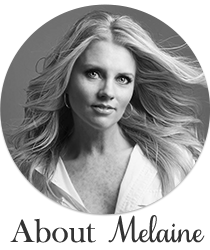 Melanie - this couldn't have come at a better time for me. We just found out my husband has cancer and he has no appetite. i made this and he loved it. i used yogurt instead of the 1/2 and 1/2. I added honey and I'm going to use bananas as well. All that spinach is wonderful. Thanks so much. You should get the Deceptively Delicious cookbook. I just got it for my bday and can't wait to try it. I have a friend who makes these "green" smoothies every morning for her kids. By the time they've had breakfast they've had at least half of their veggies and fruits for the day. I was really doubtful about the taste but she made me one - with lots of strawberries and bananas too- and I was surprised at how good it was! What a great share! Thanks so much, this one is definitely getting tested at our house. I really need more iron in my diet and was struggling to find a way to naturally fit more in! Thanks a million! oooh thanks for this. always on the hunt for a good healthy smoothie recipe:) we are not great about veggies either. What a extraordinary recipe! Instrument definitely think this a spin. We launch a really undreamed affix that helps kids get more veggies too. I couple your journal and all the wonderful things you percentage. You are an breath! Thank you SO much for recommending our drink for your delicious tasting smoothie! We’d love to add the recipe to our website, with your permission?